An all-new 2017 Ford F-450 Super Duty at work. 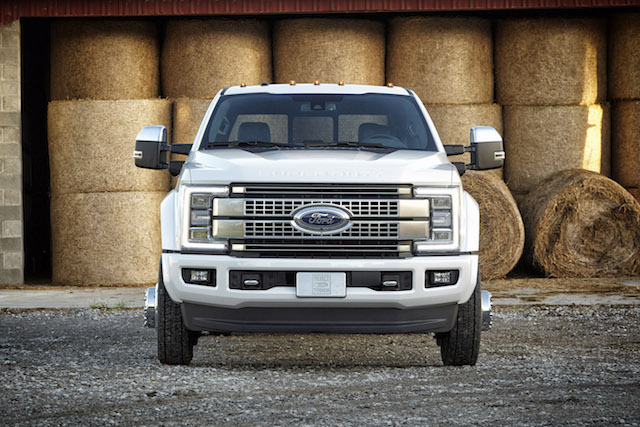 In an absolutely expected move, the Ford Motor Company is dressing the 2017 Ford Super Duty with an aluminum body. Soon, all models bearing the F-Series name will use this lightweight material, with the heavy-duty truck coming in up to 350 pounds lighter than its predecessor. Ford says that the new truck, to be built at the Kentucky Truck Plant and available late next year, will benefit from an all-new fully boxed frame. That frame will be composed of more than 95 percent high-strength steel with stiffness 24 times greater than the current frame. This change alone will benefit towing and hauling, already two of its strongest suits. Other modifications bring in four-wheel drive components, driveline, axles, and towing hardware, to provide enhanced heavy-duty capabilities. Like the 2015 Ford F-150 that started it all, the 2017 Super Duty makes use of high-strength, military-grade, aluminum alloy, what the manufacturer claims is more dent- and ding-resistant than the present steel body and is also impervious to red rust corrosion. 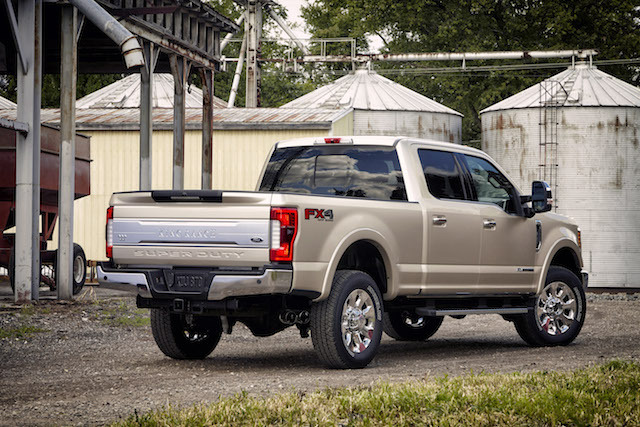 The two alloys effectively reduce the Ford’s weight, with savings of up to 350 pounds realized. Those savings also extend to the chassis cab as it receives a brand-new, high-strength steel frame with an open C-channel design located behind the cab. The new configuration was designed to facilitate aftermarket upfit and modification. Ford has not provided towing and payload numbers for the new Super Duty. 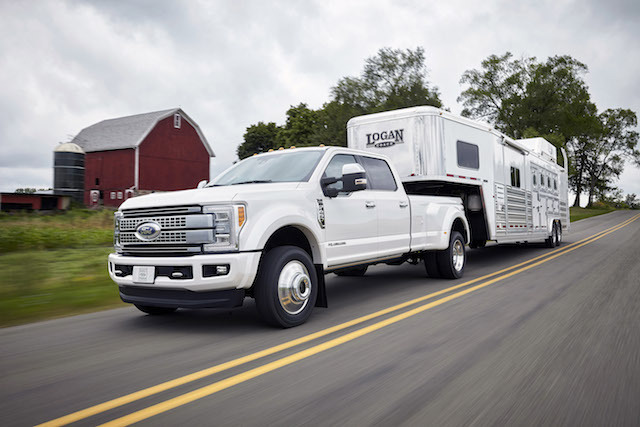 However, the automaker says that it is rolling out “advanced coaching and camera technology,” in a bid to ease both conventional and gooseneck (fifth-wheel towing) for drivers. 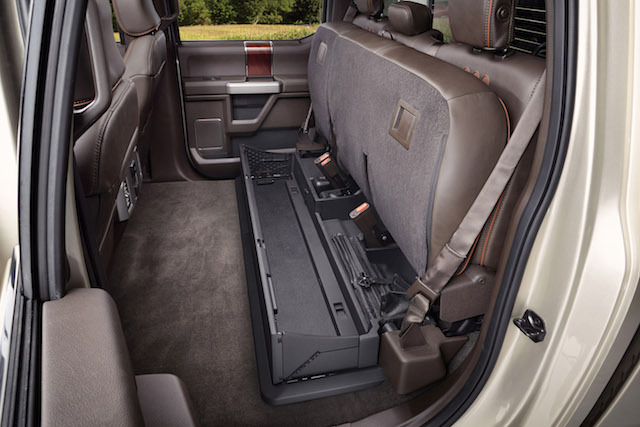 Furthermore, the Super Duty receives numerous new features, including some that are not found elsewhere in the heavy-duty segment. For example, LED lighting and adaptive cruise control arrive, features not found in competing trucks from Ram, Chevrolet and GMC. 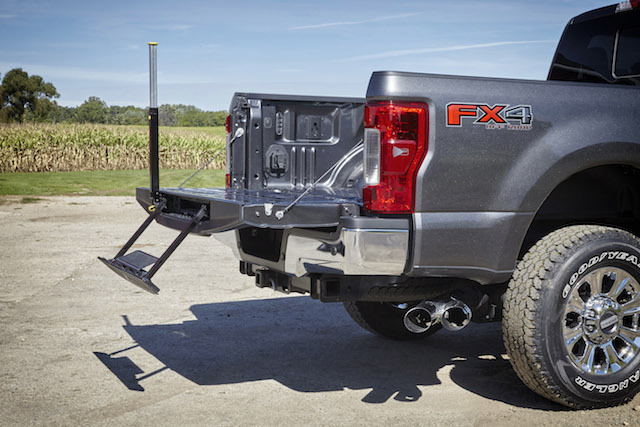 Also, the new truck receives a center high-mounted stop lamp camera, what increases visibility into the cargo box — especially helpful when connecting for gooseneck towing purposes. At work is a 360-degree camera system, comprised of four digital, high-definition cameras. The system provides a panoramic view of the truck. 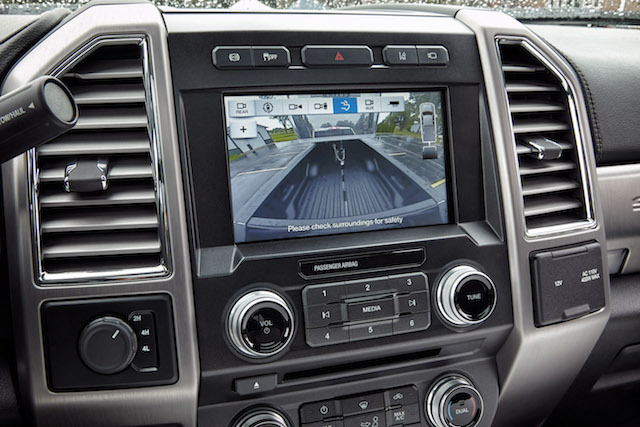 Moreover, Ford will include reverse guidance cues and tips to help drivers as they move a trailer in reverse. Lastly, a factory-available trailer camera is now available for the first time and can be attached to the trailer. Other changes include a standard or available tire pressure monitoring system, adaptive steering, SYNC 3 telecommunications, a Blind Spot Information System, lane departure warning with steering wheel vibrations, and the adaptive cruise control system paired with collision warning and brake support. In addition, Ford says that various lighting changes are in evidence, including LED side view mirror spotlights, quad-beam LED headlamps and tail lamps, and a new LED cargo lighting system. Three engine choices return for the 2017 Ford Super Duty. A 6.2-liter gasoline V-8 engine is now paired with a new TorqShift-G transmission, a six-speed automatic gearbox featuring a more robust torque converter arrangement. Also available is a 6.8-liter, V-10 gasoline engine. The third engine choice is the second-generation, 6.7-liter Power Stroke V-8 diesel, a Ford-built product. The automaker hasn’t released performance numbers yet, but it is expected to improve upon the current horsepower and torque ratings. The next generation Super Duty will offer three cab choices — regular, SuperCab and Crew Cab. Super Duty shoppers will also have five trim levels to choose from — XL, XLT, Lariat, King Ranch and Platinum. Prices and performance numbers will be provided closer to this model’s release date. Super Duty photos courtesy of the Ford Motor Company.